Paul and Silas show us how to reach cities for Christ. Their work in Thessalonica made an eternal difference in the worst of circumstances. Acts 17 tells us what happened after the missionaries left the bitter-sweet experience at Philippi. Paul and Silas experienced a terrible beating in Philippi but saw God work both in prison and in the city. Thessalonica showed the same elements without the beating. Thessalonica was the city where those opposed to the gospel declared that the missionaries had turned the world upside down. May you and I do the same. First, notice the strategy of Paul and Silas. They went to the places and people most likely to hear the gospel. These were Jews in the synagogues. Very likely, Paul and Silas passed up places without synagogues, such as Amphipolis and Appollonia. They carried the gospel to those who were most open and depended on those who believed to carry the message to others. Second, notice the intensity of the missionaries. They spent three weeks reasoning, explaining, proving, and proclaiming (Acts 17: 2-3). No wonder Luke described such an abundant number of converts in Thessalonica. “Some of the Jews were persuaded and joined Paul and Silas, as did a large number of God-fearing Greeks and not a few prominent women” (Acts 17:4). Third, notice the opposition they faced. Someone said a long time ago that wherever Paul went he either started a revival or a riot. Actually, in Thessalonica and most other places, he started both (Acts 17:5-9). In spite of the opposition, Paul and Silas, as well as citizens of Thessalonica such as Jason, continued in the faith in spite of the opposition. Doing things right and being a faithful witness will always stir opposition. We are called to be faithful in all things and in all circumstances. When we set up a good strategy and follow it, live and witness intensely, and carry on in spite of opposition, we can take a city by storm. I read your blog today and smiled. It was the sad smile of one who has seen effective fervent prayers answered, the effective intentional sacrificial giving bear fruit, then spiritually led plans abandoned. Most sadly then have those who would be called ‘leaders’ say that to remember the lives, sacrifice and dedication of many is divisive and unhelpful. Yes, each day is a new day. Scripture tells to build upon the Foundation God has laid. His Seal is not to be replaced with the seal of any man. 1. 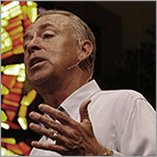 Consider the Ministry of J. D. Grey, twice leader of the Southern Baptist Convention and pronounced Doctor for his work. Even Carlos Marcello recognized his position and celebrated it with the present of a new suit saying: a man in your position should have a suit becoming of your station. When J. D. Grey arrived he had to give the taxi driver directions to First Baptist Church of New Orleans. A book published, Saint J. D., is worth a look (In 1969 a biography of him was written by Robert L. Lee and James F. Cole titled “ST. J.D.”). “Jul 29, 1985 – The Rev. J. D. Grey, pastor of First Baptist Church for 35 years and president of the Southern Baptist Convention in 1951 and 1952, died Friday.” I supposed the words of a fine elder lady evicted from Apartments owned by FBCNO, she had lost her family many years ago, recalled the words of J. D. Grey to her, “It’s okay, we’re your family. We’ll take care of you.” I don’t know a lot about fidelity to the McFarland Trust. Perhaps you do, as I recall words when the fidelity to intent was brought up in a meeting, “the Church can do whatever it votes to do with the funds.” How true are the motives of the heart. The daughters of Rev. John Curtis came by the burned church yesterday, Ed said, and carried away the cornerstone, the one that said “1854,” the year the sanctuary was built. As of 5PM today, the entire front of the church has been destroyed with the rest to continue tomorrow or Monday. There is no more tower to fight for. What remains is a lesson of neglect, loss and future preservation. People, the city just cut off its nose to spite its face. We just lost the oldest Baptist church in the south, the first one to hold services for slaves in pre-emancipation days and a treasure trove of history. Not a plaque remains to remember this building by (although the retrieval of that plaque is part of the follow-up plan). It is crucial to get to the bottom of this issue before it is used as a precedent to demolish other historic buildings in town for carpetbagger-developers and new architecture discordant with any given neighborhood. Even from a purely economic standpoint, this demolition was a foolish move given that, without its history, New Orleans has very little appeal. Demolition by neglect should be a crime in a beautiful and hurting city on a shoestring. Once we relinquish that which we have going for us, what’s left to preserve? Coliseum Place Baptist Church was plagued by several architectural disasters over its existence. This Gothic Revival church was designed by John Barnett. One accident occurred during construction when the tower collapsed. Hurricane Betsy also caused major structural damage to the tower in 1965. The photos above show the church’s 2002 appearance along with a pre-Hurricane Betsy view of the steeple. On June 21, 2006, after receiving substantial damage from Hurricane Katrina, the church burned to the ground. Historical records indicate that there were two pipe organs installed at Coliseum Place Baptist Church through its recorded history. The first organ was a Flegemaker (Opus 409), installed in the 1870’s. Not much is known about the specification of this organ. Later, in the 1920’s, a three manual, four division Hilgreen-Lane (Opus 908) organ was installed. The staff of New Orleans Churches.Com is presently investigating as to whether these organs are still in existence. 3. The Carver Center, Rachel Sims Mission, The Brantley Center, The Friendship House all were strategically placed in areas of need and prominence. All abandoned by Southern Baptists. Dr. David Crosby had a few choice words to say about the stewardship of this move by our Convention and Home Mission Board. As he is still alive and on message, you can ask him directly as I joined him in mourning over the decision and the fight to realize the Vision on a longer term basis. They each have their story. All had a tremendous impact, fulfilling their mission. All suffered neglect and underfunding. 4. Then there is First Baptist Church of New Orleans, built under the leadership of J. D. Grey as they moved from Delechaise Street to the corner of St. Charles and Napoleon Avenues. The location was touted as one that was recognized around the world. I had the privilege to serve on the Building Committee as a Deacon and knew Dr. Mark Short, made a Doctor because of his work with Southern Baptists. Dr. Short, then Mr. Short, taught a Church Business Course at New Orleans Baptist Theological Seminary. He often used First Baptist Church of New Orleans as an example of having a plan and working it. He spoke of 5, 10, and 20 year plans. Plans to make Touro Synagogue a parking lot. The laugh is on Southern Baptists, Touro now uses the previous Southern Baptist Parking sold to the Catholic Church School that now resides there. Two prominent members: Pat Taylor and Chris Owens were never considered (as far as I know) except by me when Dr. Crosby came with a mandate to move the facility close to an Interstate. Previously, I was in a meeting where Al Copeland’s offer was considered to lease the parking lot during the week for Valet parking and not conflict with calendar events of FBC. In exchange he was willing to promote First Baptist Church with flyers inviting diners to return to the location on the weekend to be spiritually fed. He was willing to provide funds and food for the Bread of Life Ministry, run out of the Annex. He was willing to maintain the grounds and cover all related insurance issues. God was working. Man was running away. 5. When the present FBCNO property became available for the new location, I approached the New Building Committee in a meeting suggesting a liaison with the local, state and Federal as well as the Railroad owners of the land surrounding the location to prepare for a natural disaster. “Fear” is what I observed. I also observed the drainage patterns of the area, had been in contact with the State DOTD (Dr. Lamb & Senator Francis Heitmeyer), Congressman Vitter’s office (met with Vitter Aid David Doss several times on site & Brian Buckle, engineer for DOTD) and State Engineers. (I had previously spoken with Governor Foster about the Mounds underpass drainage issue but was unable to get a meeting finalized while he was in office.) I suggested a Katrina event would make this area an island, a staging area, a place of ministry and an opportunity to serve God in a mighty way with a little preparation now. Further, that a bypass was much more economically possible with FBCNO’s cooperation to ensure a route around the Mounds Underpass. I was politely thanked for my concerns and dismissed. Maybe lessons have been learned. It is interesting to see the life changes in some of those who were present in that meeting. Please forgive any errors above written through the pain of hazy eyes and many interruptions.